Located in the eastern part of the Indochina Peninsula, Vietnam provides a diversified topography ranging from mountains to hill to deltas in which Mekong delta in south is impressive with the natural scenery that can only be fully appreciated when traveling from place to place at a nice, slow pace. 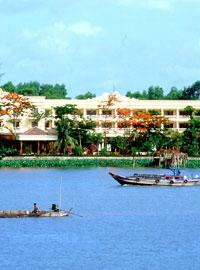 and comfortable motorized –boat Mekong Queen (in Cai Be) and Mystic (in Can Tho). At 8 o’clock, our guide picks you up at hotel and departs for Cai Be where you will begin the beautiful cruise on a deluxe wooden boat, the Mekong Queen, visiting the small but quaint Cai Be floating market. You can observe all of busy trading activities of local traders with several kinds of agricultural product from one boat to another. You then continue the cruise to local family -run factories, orchards, have opportunities to communicate with local people and taste local products with hot green tea. Returning to the boat to take a 50 minute excursion to Dong Hoa Hiep Island and discover the beautiful and peaceful sceneries together with the typical life of the region a long the Mekong River. Stops and visits can be made during the excursion. Lunch will be served at an old Mandarin house that was built hundred years ago. After lunch, we can walk to our boat or take a small rowing sampan for another one hour and a half cruise through Dong Phu canal, Binh Hoa Phuoc, An Binh to Vinh Long, the capital town of Cuu Long (nine Dragon) province. Our own private transportation vehicle will transfer us to Can Tho City for overnight. Today is another valued moment. We get up early for a wonderful join –in breakfast cruise, followed by a visit to Cai Rang floating market. Here is the chance to become excellent photographer for amazing pictures. Back to the dock in the late morning, a transfer back to Saigon. On the way, we stop at My Tho for a visit at Dong Tam Snake Farm and Vinh Trang Pagoda.